Showing posts for the Neopolis tag. This has triggered some questions by interested gamers. The key question they raised was, to paraphrase: "But aren't those the things that make a game an RTS?” Well... yes and no... and as that is a totally vague reply, I decided to write this devlog to try and answer this question properly, in the context of our game mechanics and our general philosophy for this game. As I mentioned already in my Sony Blog post, there are historical reasons why most strategy games incorporate resource mining and technology trees. In fact we can pinpoint that pretty much to the release of a specific game: Dune II. This isn't controversial and has been the basis for many successful (and wonderful) strategy games. What people seem to forget or ignore however is WHY these elements were introduced in the first place. Yes they make design sense, overwhelmingly so even, but they especially make sense in the context of the wider Dune universe narrative! Seen in that light the real genius of the game shines through as it very elegantly translates these facets into a great gameplay structure: Send out harvesters to mine spice, use this to facilitate base and unit construction, and unlock technology trees to develop additional unit types. A perfect structure for a Dune game! However, does it not make sense to adopt different mechanics, or a different interpretation of mechanics for games in a completely different setting, or games that want to present a different overall experience? I think so, and to some degree I have already successfully done this before in a single player context, with our game Eufloria. Mechanics are hidden behind menus and cause a steep and long learning curve without intimate knowledge of the genre. Gameplay is too focused on finding an ideal path through a complex technology tree. Games can be entirely about optimising unit and base construction. Resource gathering can become rather tedious. Some games tend to be too reliant on just creating a wave of units with which one can rush an opponent. What does it all mean in practice then? I will try to illustrate this by shining some light on how I treat the core elements of the genre in the text below. To stop things from getting too dry and to provide context I have also created a video where I discuss and illustrate most of these. Please scroll to the end to find it. Neopolis simply don't do this. 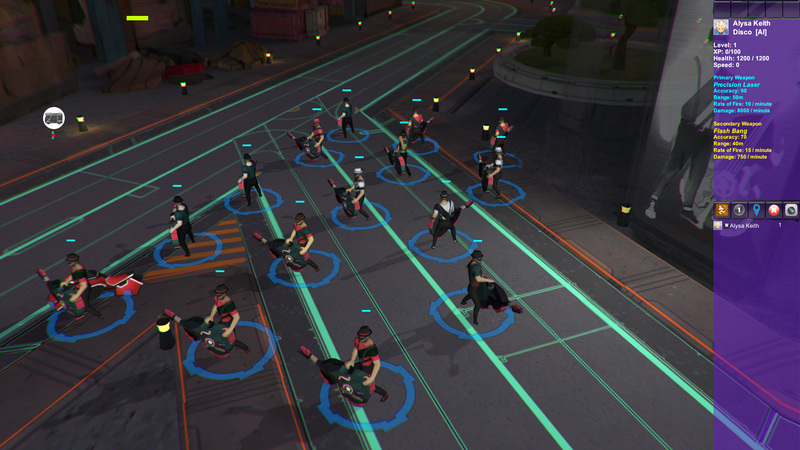 In Neopolis you start out controlling a gang's headquarters (HQ) and a finite number of gang members (Gridrunners) associated with its turf. You cannot use your HQ to "construct" more gridrunners (units). Initially, you simply control the lot you were assigned with at the start. However, the city grid (level) is populated by other unaligned gangs. (There are several different gangs (crews) in the city and they each function as specialist units in their own right.) So, to gain new recruits you must go out and conquer the territory of unaligned crews. It is up to you to decide when to do this, and which crews to try to conquer. If any of your own crew perish in the process they are replaced by rookies at their HQ. 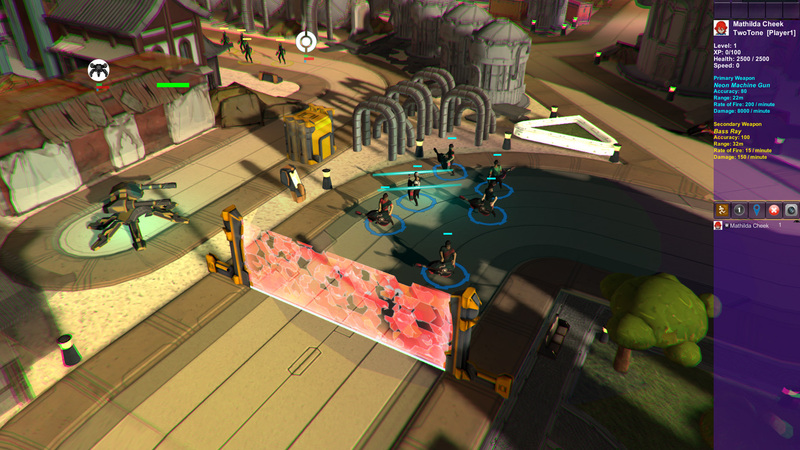 This prevents rushing tactics, yet allows a player to replenish troops up to their base level. Other units (Vehicles, tanks, mobile turrets, etc.) can simply be discovered in the city. Exploration is vital! Neopolis doesn’t do this in any traditional sense either. In Eufloria your units WERE your resources as you had to sacrifice them in order to grow new plants, which acted as unit growers. In Neopolis I dispensed with this altogether as your core units are always replenished at your HQ. (there are penalties involved to balance this out). However, players CAN level up and develop new skills as they do. This is very powerful if used strategically which means that experience itself becomes a kind of resource to gather. In Neopolis there is no building of bases or other buildings. Instead, all structures are found out in the levels (the city grid) and they can be occupied, conquered, converted, or they can function as traps (occupied by enemies). This very much fits with my core philosophy but also fits the cyberpunk aesthetic, where the city is as much a "character" as the people that live in it. Furthermore, because the city grid restricts unit movement to the roads system interacting with the buildings become part of core strategy. As a result terrain is hugely important in our game. This mechanic normally functions in two ways: Firstly, It allows the player to diversify their specialist units, but funnels this process into a series of strategic choices. Secondly: It restricts access to certain units along a timeline. I find this can be quite off-putting to new players as many of these possibilities are both overwhelming and opaque, as they are hidden behind menus and require a lot of experience and memory to use effectively. My approach is once again to make this more integrated with the game environment and befitting of the cyberpunk setting. In Neopolis you diversify unit types by explicitly conquering the HQs of crews (all crews are specialists in their ability sets and AI) or you simply go and find specific unit types (like mobile turrets) in the city. Additionally, you can re-designate buildings to provide different functionality. This matters as one of the designations (Dojo) allows a player to train their units and grow their experience. Furthermore, some buildings have specialist functions that are normally covered by the technology tree: hospitals, repair facilities, road barriers, and so forth. None of these have to be build or slowly unlock over time or off some tech tree branch. They are simply part of the city and can be utilised by player and opponent alike. 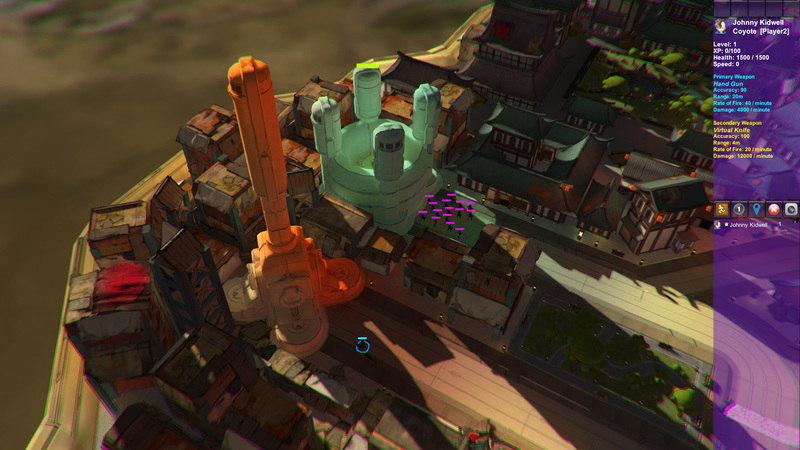 In fact a lot of the game's strategy comes from controlling and exploiting different buildings and structures. If you feel like discussing this further why not join us on our Neopolis forum? First things first: Neopolis is coming to PlayStation 4! I wanted to announce this a long time ago, but we had to make sure the deal was done and the papers were signed first :-) I wrote a nice blog post to announce this glorious fact over at the Sony PlayStation Europe blog. 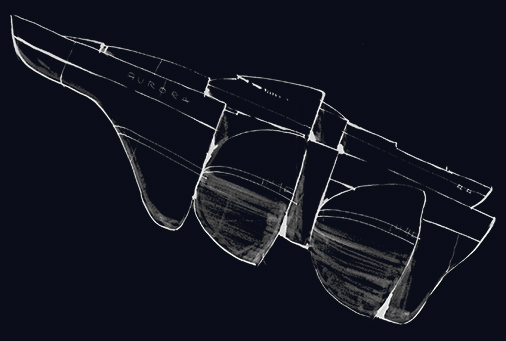 It explains some of the motivation behind the game, so for the full skinny go have a peek. We also created a nice announcement trailer for the occasion. It gives a flavour of the game and the general vibe, but it just scratches the surface of what is to come. I'm currently writing a devblog post that goes into a lot more detail, but have a look anyway. There are some new screenshots as well. Although we are only at pre-alpha (about a year before release I reckon) the game's visuals are getting pretty exciting. Here is an example so have a look for yourself! 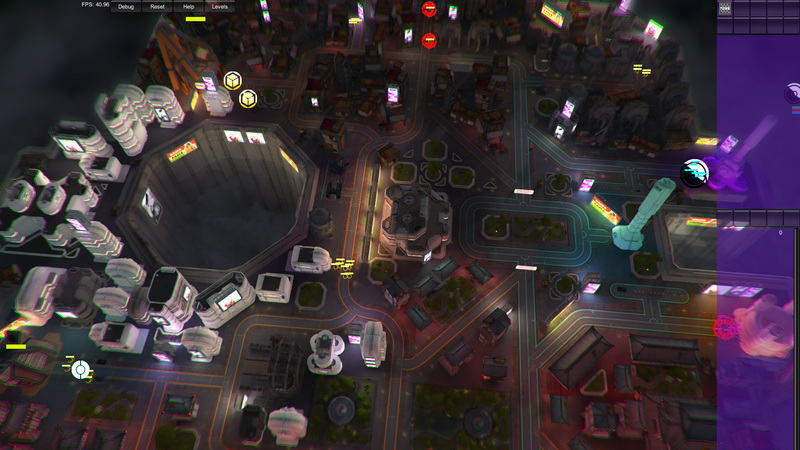 I've added a bunch more screenies to the Neopolis landing page if you want to see more. Wondering who did the cool music in that trailer? Well, that would be Electric Cafe (Mark Day) who is also creating all the game music and sound design for Neopolis. And guess what; he just released the trailer music and a few cool edits of Neopolis tracks on his soundcloud page. Come and get it! Finally, just as a treat, I made half of the Neopolis screenplay I wrote available for download. Part of my gamedevelopment process includes writing or creating in other media, and in this case I wrote a pilot episode for a Neopolis tv show (I like to think big). It got a lot of love from my peers in the filmmaking community so I decided to make half of it available for download. If you like cyberpunk give it a read. Hello friends! It's been a while since I updated but that's because we knuckled down and really focused on dev for a long time. (Hopefully it will tell) However, we now have more news and content than you can shake a stick at. I'll spread it out over the next few weeks, but here is a first installment. Amazingly, and wonderfully, we are nearing completion of this game, and are about to hit full on beta. We are actually running a little pre-beta right now, which is giving us some very promising results. As we have been on this project for 6 years or so that is quite a relief. Hopefully it will shine through! 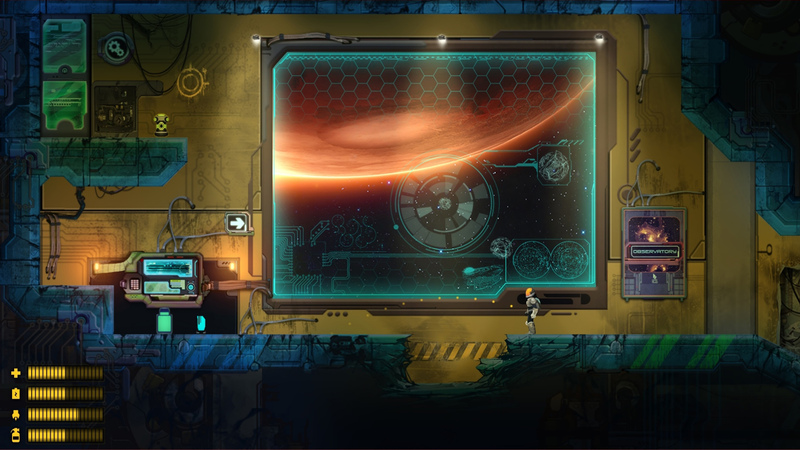 For those of you who are new to this game: StarLit is our ode to 2d sci-fi exploration. We tried to make it a progressive and immersive experience while at the same time evoking classic scifi. I think the game has come a loooooong way. an unbelievable amount, and personally I'm very proud with what we are doing with it. The inimitable Brian Grainger who made the music for Eufloria, is back on board and is creating an amazing soundtrack. The equally amazing Mark Day (from Aqua Kitty fame) is creating all the sfx and ambient audio. I couldn't be more pleased. 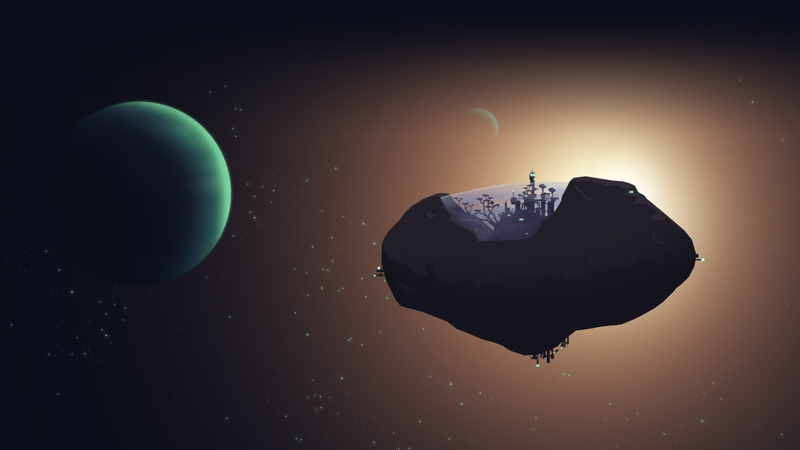 Neopolis and Eufloria RPG have also come along in massive leaps and bounds. I will be adding new screenshots and art on their respective pages soon. I might add some new video soon too. I also hope to be able to give you some big announcements about these titles soon. So, after being on posting hiatus for a while I am now starting again. \o/ Updates for the Devblog area will follow soon, and new media will arrive in a steady stream.